ZIONSVILLE, IND. – Denise Ward Designs joined more than 160 juried arts and crafts vendors at the annual Zionsville Brick Street Art Festival held in historic downtown Zionsville on May 18. Local artist Denise Ward displayed her line of quality handcrafted lampwork, sea glass, 14K GF, and sterling silver semi-precious earrings, bracelets and necklaces for sale among fine artist paintings, artistic carvings, handcrafted sculptures and repurposed antique collectibles. 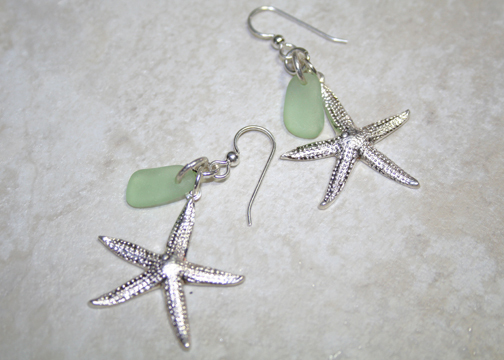 In addition, Eileen Champagne of Carmel, Indiana, was the winner of a drawing that Ward conducted for a pair of Sea Foam Sea Glass Sterling Earrings. For more information about Denise Ward Designs, please visit http://denisewarddesigns.com. You can also connect through Facebook. This entry was posted in Press Releases and tagged handmade jewelry, Zionsville Brick Street Art Festival by Admin. Bookmark the permalink.